On Tuesday night, we got 14 to 16 inches of snow in Estes Park, Colorado where we are now. It has turned this place into a Christmas postcard scene. This tree near the front of our motel looks like the tree on any number of cards I have sent out over the years. The trees and deep snow in front of the local library. There are snowy mountains behind those trees but you can't see them for the fog and snow. 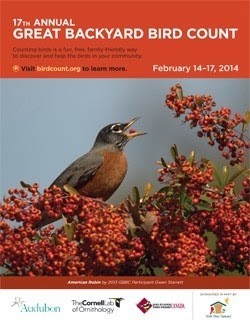 There are plenty of snowbirds - Dark-eyed Juncos - around. They're not reindeer but there are plenty of these guys hanging around, too. It amazes me that they are not at all skittish around people and they wander freely around the town. Hunting is prohibited in Rocky Mountain National Park and Estes Park exists primarily to serve visitors to the big park, one of the most popular destinations among the national parks. Whenever you see a herd of elk, there will always be at least one of these big fellows with them, especially at this time of year which is their rutting season. All of these pictures were taken yesterday. It is a gorgeous day today. The sun is out and the temperature is supposed to climb above freezing this afternoon. We're off to the park to enjoy a day with Nature and view more Christmas postcard scenes. Early tomorrow morning, we are heading out to Colorado for about ten days. I'm really looking forward to seeing mountains, snow, maybe some new birds, and especially some of the wonderful gardens I've heard about. The famous Denver Botanical Garden is high on my list of "must see" sights. I don't expect to be doing a lot of blogging on this trip, but no doubt I'll find time for occasional entries here, so stay tuned! Finally this week, after bemoaning the absence of Monarch butterflies for most of the year, I've had a steady stream of the beauties in my garden. Perhaps the change in the weather has brought them this way. Who knows? I'm just glad they are here and giving me a chance to record their visits with my camera. Finally, there are visitors who are making good use of my lush stand of milkweed! There were two of the butterflies present on this particular occasion, one male and one female. This one is the male. You can tell he's a male because he has those two small black dots, one on each of his hindwings on either side of his body. This is the female. She is slightly larger with longer wings than the male. Here are the two of them together sharing a milkweed blossom. The male is out front and the female slightly behind him. The pair spent a good long period together among the milkweed, sipping nectar and resting with the wings outspread on the leaves. I hope that the female might have left me a present behind in the form of her eggs. In addition to the milkweed, there are still plenty of other blossoms around to tempt the Monarchs and the other butterflies that are slowly showing up in the garden. This purple trailing lantana is full of blossoms now and it is favored by various butterflies. I often see them visiting. The blossoms of the abelia is favored more by the bees, but I do see butterflies stopping by the shrub occasionally. 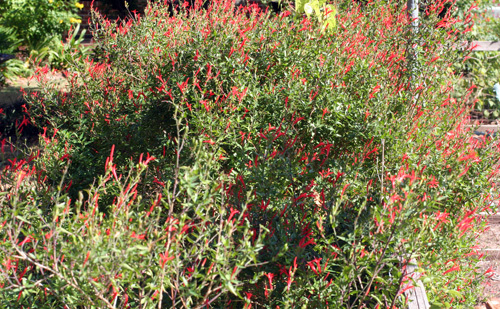 The red-orange blossoms of the Cape honeysuckle attract the few hummingbirds that are still passing through, but butterflies stop to sip, too. I've noticed that the 4 o'clocks seem to be a favorite of various skippers and of the sulphurs. Monarchs will stop by, as well. Yes, it has been a down year for butterflies in general and that continues to be true, but their absence is not in any way related to a lack of host or nectaring plants. The cafeteria is well-stocked for any that find their way to my yard and the welcome mat is out. Let it be duly noted in the record that October 2011 was the month when Southeast Texas finally began to get some relief from our long drought and our interminable summer. The temperatures began to moderate ever so slightly and, last weekend, my yard got a total of 3.3 inches of rain! That was more than we had had in the six previous months. The long-suffering plants in my garden have responded to these pleasant conditions with a new flush of bloom and a perkiness of spirit to make a gardener's heart glad! Let me show you what I mean. The tropical milkweed is one of those plants that never missed a beat all summer long. It has been in constant bloom. Unfortunately, there haven't been many butterflies to take advantage of those blooms or of its leaves that feed the caterpillars of Monarch and Queen butterflies. 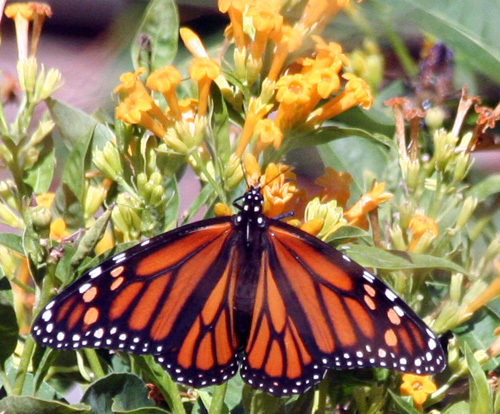 There have been a few Monarch migrants straggling through recently. The brugmansias have suffered severely from the drought but they are finally blooming. However, their bell-shaped blossoms are only about half their normal size. The name of this Buddleia davidii is 'Royal red.' I would have named it 'Royal purple,' but that's just me. Several hibiscus in the garden have done surprisingly well this year, especially this sunny yellow one that has put out bloom after bloom all summer and fall. And it has been matched bloom for bloom by this sorbet pink hibiscus. 'Graham Thomas' has pouted a bit during the long drought, but has now caught its second wind and is blessing me with its wonderful squashy blossoms. 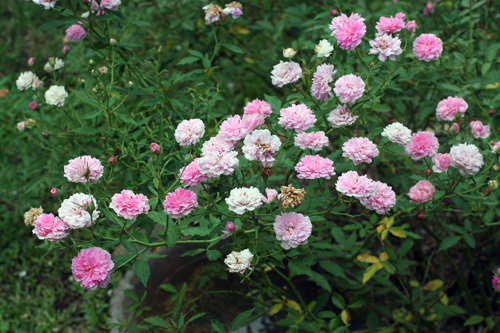 The 'Radazz' Knockouts continued to struggle to produce a constant blush of bloom throughout the season. Often the blossoms were smaller than usual but they were ever constant. I am entranced by the delicate violet-like blossoms of the chocolate plant. No survey of blooms in the garden would be complete without mentioning the yellow bells of Esperanza. Almond verbena. Wonderful plant. Wonderful highly-scented blossoms. Bees absolutely love it. So do hummingbirds and butterflies. The prairie asters are beginning to put on their annual show. Autumn sage blooms pretty much constantly throughout the year but is definitely at its best in autumn. The Blackfoot daisies are responding to the more moderate weather with a new flush of blooms. The shrimp plant's blossoms really do look like one of those large, succulent Gulf treats. The plant is covered in these blooms. Low-growing 'Katie' ruellia is not as invasive as some of the ruellias and it does have lots of these wonderful blue blossoms. It just wouldn't be my garden without plenty of tithonia, Mexican sunflowers. This tradescantia is blooming its 'Purple Heart' out. The confused white loropetalum has been sending out a few of its fringy blossoms lately, although it normally blooms in spring. It's just celebrating the change in the weather, I think. This purple porterweed doesn't seem to care about the weather. It just keeps on blooming. The same can be said of Turk's cap which has been even more full than usual of its red turban-shaped flowers. The 'Rouge cardinal' clematis bloomed beautifully in the spring and now is giving me its second flush of these wonderful blooms. Even the old 'Barbara Karst' bougainvillea is getting into the act. The pretty little blossoms of the Evolvulus glomeratus, 'Blue Daze,' are a sweet sight for a tired gardener's eyes. A glory of the morning garden is this morning glory which always makes me smile to see it. The vine is raggedy and is wilted through much of the day, but it is always completely covered in these gorgeous flowers. 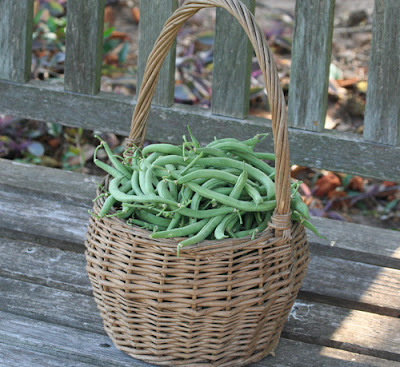 Autumn is really the best time of year to be a gardener in Southeast Texas. This year, I'm happy to say, is no different. Happy autumn - or spring, as the case may be where you are - and happy Bloom Day! Don't forget to visit our gracious hostess Carol at May Dreams Gardens and see a list of the other Bloom Day participants. 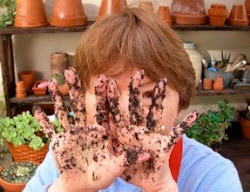 By any yardstick one cares to use, this year has fallen well shy of the mark for gardeners. In fact, it has been the most challenging year to be a gardener in Texas that most of us can, or care to, remember. A lot of good plants were lost during the long, hot, dry summer. I told you about some of my losses here. But I don't want to leave you with the impression that the year has been a total wash-out. Along with the losers, there were plenty of winners. Nearly all the plants that were lost in my garden had been planted there within the last couple of years and so they had never experienced anything but harsh weather, either hot or cold. They had never really had a chance to get established. But most of the plants in my yard have been here a lot longer than two years and are well-established, and, even though they may have suffered, they came through all the trials provided by the weather and they are still standing. Most of my "winners" will be very familiar to regular readers of the blog. Here are just a few of them. Hamelia patens, sometimes called firebush or hummingbird bush, has never been as floriferous as it has this year. These shrubs never get the water or the care that some other parts of the garden get, but it doesn't faze them. Anisacanthus wrighiti, flame acanthus, is another that has completely outdone itself in blooming this year. It started blooming early and has hardly taken a pause all summer and now into the fall. It just keeps on sending out masses of these little orange, flame-shaped blossoms. These shrubs, too, get very little care or water, but they seem to thrive on my neglect. Likewise, all the crape myrtles in the yard, like this oldest and largest of the lot, have bloomed continually since late spring and even now are full of blossoms. The old-fashioned 4 o'clocks have scarcely been bothered by the severe weather. 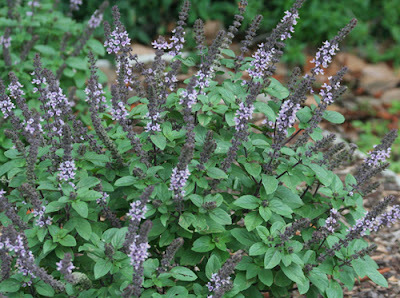 In the herb garden, the African blue basil has provided a banquet for bees since the spring and is still going strong. Much of the spring/summer vegetable garden was a bust, but the green beans were a huge success. The same was true of the summer squash. Both the zucchini and the yellow straight-necked squash kept on producing until we were well and truly sick of squash! I have many different kinds of salvia in the garden and almost all of the plants, like this 'Otahal', have thrived and continue to put out blooms. On the whole, it's not been the best year for roses, although, except for two yellow Knockouts, they have all survived. But there's one rose that I always know I can count on, come drought, flood, heat or cold. It's the 'Caldwell Pink.' If there's anything that can stop this rose, I haven't met it yet and I hope I never do. I have often sung the praises of this plant, the yellow cestrum, and no doubt I will again. It has not been out of bloom since April and the bees and butterflies absolutely love it. Well, I could go on, but you get the idea. My garden is really not the vast wasteland that, in my despairing moments, I may give the impression that it is. In addition to these winners, there are almond verbena, 'Cuban gold' duranta, 'Montrose purple' vitex, oakleaf hydrangea, cannas, Turk's cap, Esperanza, porterweed, buddleias, hibiscus, abelia, potato vine, Texas sage, muscadine, loropetalum, tradescantia, leatherleaf mahonia, just to name a few that have laughed at adversity and kept on growing and producing. Check back in a couple of days when I do my Bloom Day post and you'll see even more of them!